CLIPSO® Acoustical Batting is a synthetic, polyester material that is both non-fibrous and lightweight. 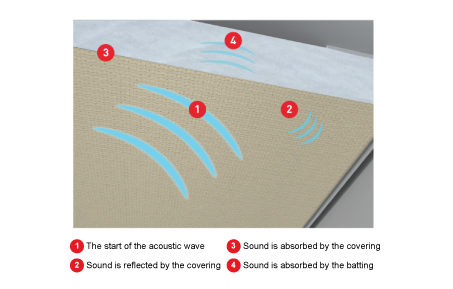 It provides a high noise absorption rate, a high resistance to moisture and is easy to install, as it contains no potentially-harmful fiberglass. When used with CLIPSO 495D Acoustic Fabric, you get a much higher rate of sound absorption because any of the sound that transmitted through the fabric is now met with the acoustic batting installed behind the fabric (as displayed below). LA 53 acoustical batting is a white, synthetic material that is 0.375 inches thick. When used in a double layer, it equals 1” of fiberglass. 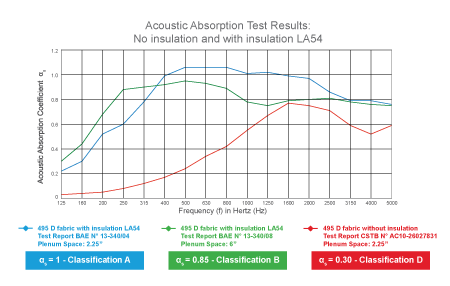 CLIPSO Acoustic 495 D fabric over one layer of LA 53 gives a Noise Reduction Coefficient (NRC) of 0.60 and a Sound Absorption Average (SAA) of 0.63. CLIPSO Acoustic 495 D fabric over two layers of LA 53 gives a Noise Reduction Coefficient (NRC) of 0.85 and a Sound Absorption Average (SAA) of 0.83. LA 54 acoustical batting is a white, synthetic material that is 1.75 inches thick. CLIPSO Acoustic 495 D fabric over 1 one layer of LA 54 with a 2.25″ plenum gives a Noise Reduction Coefficient (NRC) of 1.05 and a Sound Absorption Average (SAA) of 1.05.